I've two acoustic guitars with an add-on pu-guard "plug & play"(matter of speaking). 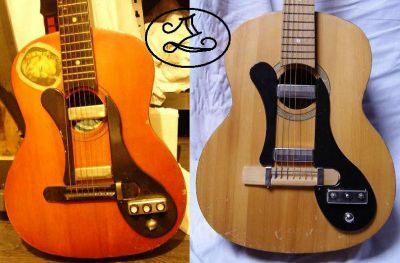 One is a Izyaslav 332-y (right)and the other(left) a Zhitomir acoustic ( pickguard doesn't fit well but what the heck...),so both from Ukraine.On the back of the pickguard there's a "L" and an (obvious-)CCCp mark.Can someone point me out the manufacturer and/or the modelname/number from this pickguard. ...and if possible : the modelnumber/name for the Zithomir acoustic ? У меня два акустических гитар с дополнения пу гвардии «подключите & играть "(вопрос о выступая). Один является Изяслав 332-y (справа) и другие(слева) Житомир акустические (pickguard не подходит хорошо, но то, что щеколда...), так как из Ukraine.On задней части pickguard там «L» и Марк CCCp (очевидно-).Может кто-нибудь мне точку производителя и/или modelname/номер от этого pickguard. .. .and если возможно: имя modelnumber для акустической Zithomir? "Device consists of two singles and a control unit. Defeat scheme is not quite clear: left stick - the master volume, the average - the general tone and the right - the signal neck pickup, mixed with the bridge pickup. Potentiometer knobs are completely similar in form to those that were placed on the guitar kit MARIA). Connector - Soviet little jack, having a diameter slightly less than usual. The device is mounted on an acoustic guitar in the socket with spring tabs upper sensor and two tiny screws on the mare. The sound of the resulting "electrified acoustic guitar" on the clean channel - predictably flat and featureless, but on reloading is quite possible to squeeze something evil and dirty, like the early "STOOGES"."